Elegant 5 stone anniversary band with diamond accents. 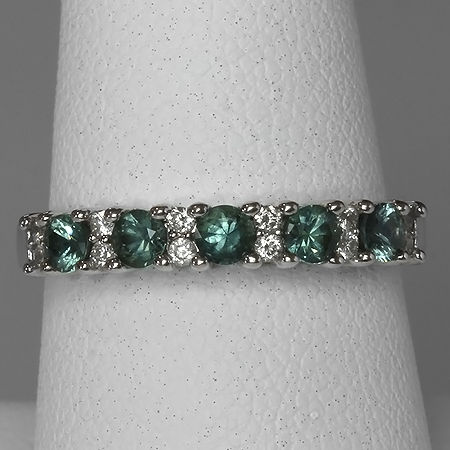 These 3mm round green Rock Creek Montana sapphires are prong-set with two accent diamonds between each sapphire. Highly polished band with white rhodium plating on diamond settings. Standard fit; sizes 5,6,7,8,9,10 - Please select your size below. * Weight listed is approximate. * Image not actual size. * Colors will vary on individual computer monitors. Please keep this in mind when shopping.